Board a red eye flight in Singapore, many hours later, arrive the next day in Sydney; in a different country, in a different continent. Hit the ground running by checking into the hotel, getting over to the Central Business District, have a Chinese dim sum lunch, walk around Circular Quay and get our first glimpse of the Sydney Harbour Bridge and the Sydney Opera House, I’d call that a pretty good day. But, we’re road warriors and who have to fit as much as possible into a day, so that’s not enough for us. We had tickets in the early evening to go up to the top of the Sydney Tower Eye, conveniently located just down the street from our hotel. Great evening views over the city, including views of the Sydney Harbour Bridge and Sydney Opera House. Afterwards, it was time to grab a bite to eat. We had dinner reservations at a funky, local restaurant a few blocks from our hotel. Gowings Bar & Grill, located inside the QT Sydney Hotel, is as eclectic and contemporary inside as the hotel it is housed inside of. 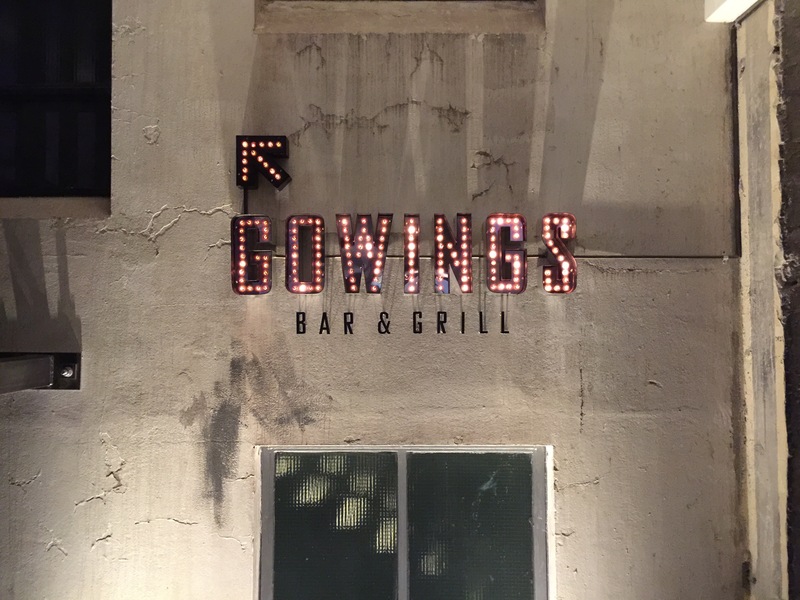 Using only the freshest of ingredients from local suppliers, Gowings serves up what they call European brasserie food and features a wood-fired rotisserie. The restaurant also features an extensive wine list and proudly displays their wine racks around an open bar situated in the middle of the dining room. On one side of the restaurant is a semi-open kitchen, and the seating area for the restaurant is set up around the bar with the bar as its focal point. Loud music, dark mood lighting and an upbeat, youthful vibe all contribute to the overall atmosphere of this hip and happening restaurant, again a reflect of the QT Sydney Hotel itself. To start off the meal, my husband ordered his standard cocktail drink of an Old Fashioned. He definitely appreciated the heavy, goblet weight of the glass the drink was served in. The bartender certainly didn’t skimp on the alcohol in the drink and didn’t water it down. 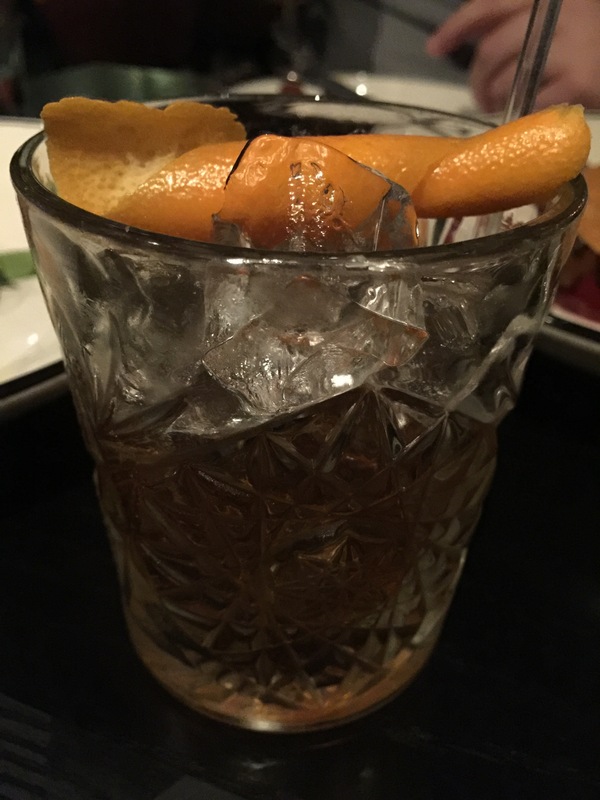 The old fashioned was flavorful, but not overly powered with whiskey so that you couldn’t taste the bitters and the orange aroma of the drink. This was a very well crafted old fashioned. For starters, my husband and I each chose an appetizer to share. Our first appetizer was the hot spanner crab cakes served with double smoked bacon, celeriac, hot sauce, aioli and lemon. Using local Australian spanner crab, the meat is considered to be of a brilliant white color, very sweet and succulent and delicate. For these reasons, using spanner crab meat to make crab cakes is a natural combination. Interestingly, the crab cakes we were served were more shaped cylindrically rather than the round, patty cakes we are used to in the United States. 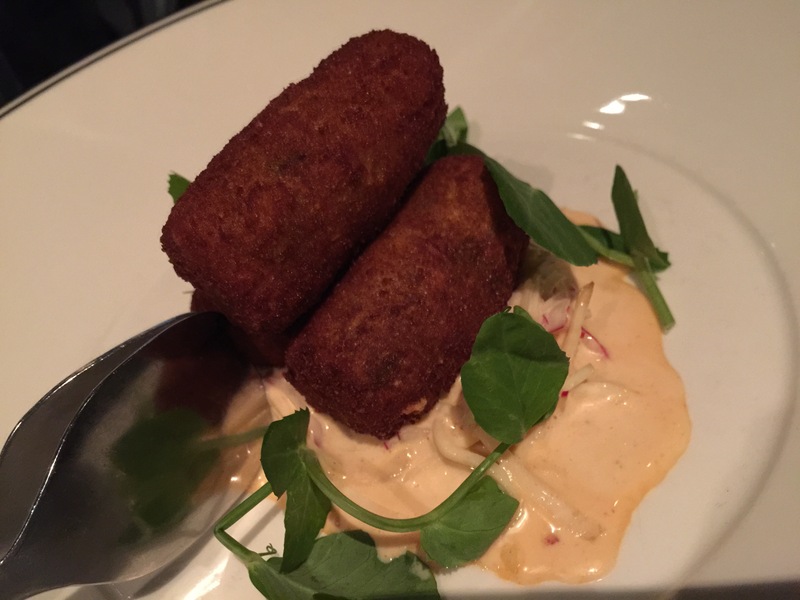 The crab cakes themselves were crispy and crunchy on the outside and tender on the inside. They were, however, made with a bit more stuffing and filling and a little less crab meat than I had hoped for. The aioli sauce was the star of the dish, with a little tang and spice, it was quite flavorful. 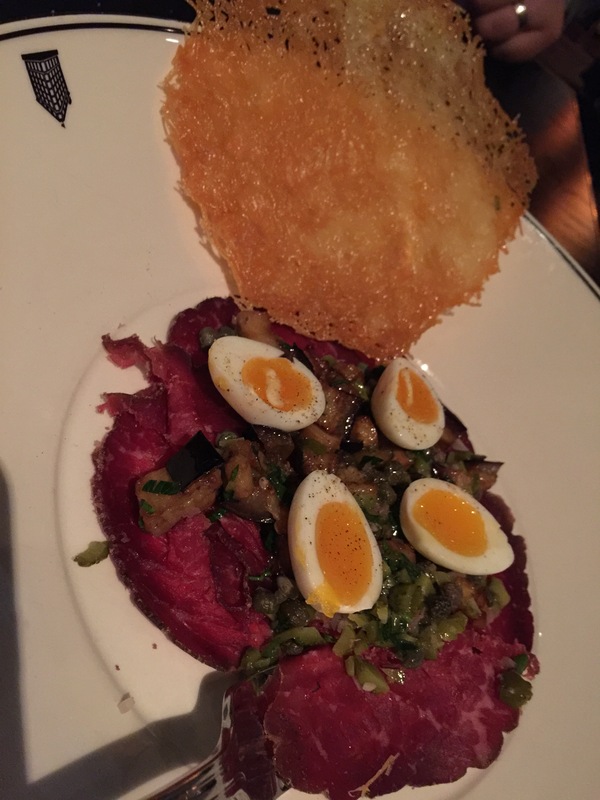 Air dried beef & eggs “a kind of carpaccio” was the other appetizer we ordered. Described as “quail eggs, crisp pecorino cheese paper, fine cut tartare of gherkin, eggplant caviar, capers, and parsley,” the first words out of my husband’s mouth was “wow, it’s really good!” The cheese crispy was a nice touch, and something different than your normal carpaccio. It added the salty touch, but also crunch and texture to the dish. The quail eggs were really good and soft boiled so they were creamy and soft. The sautéed eggplant was an interesting touch as I’ve never seen eggplant on a carpaccio dish before, but it worked with the gherkin and the capers. 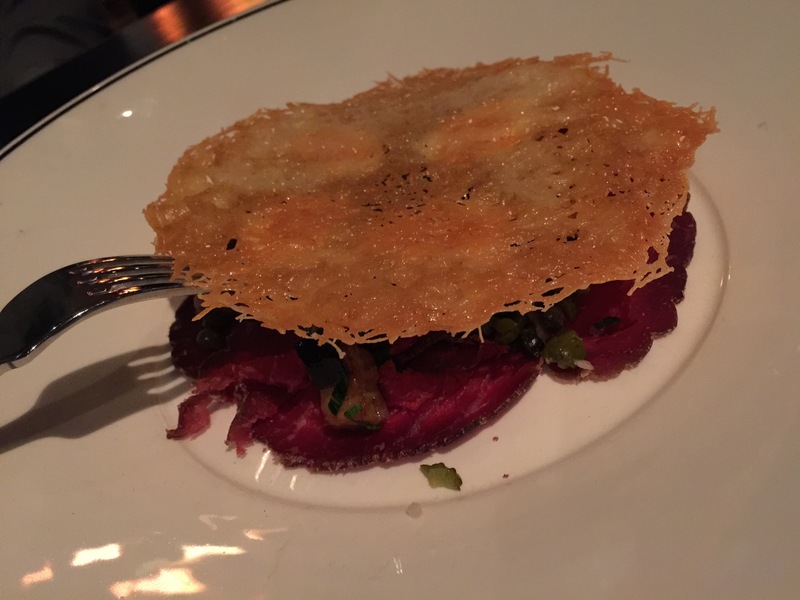 In my husband’s eyes, this dish was “top shelf,” which was interesting as I’m generally the carpaccio lover. 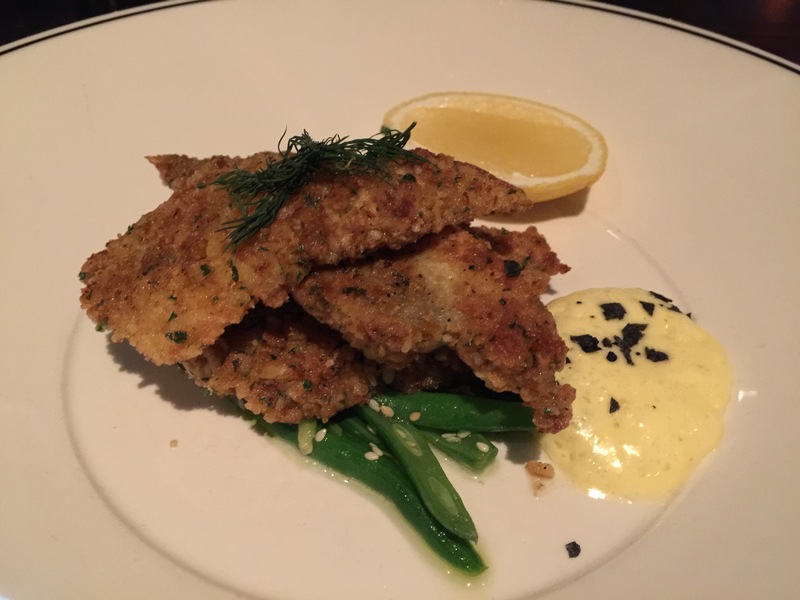 For dinner, I ordered the baked pretzel topped whiting filets served with steamed French beans, dill, black sesame, finished with virgin butter and lava salt. I was still a bit full from lunch earlier and was just looking for a light meal and this fish dish sounded like it would fit the bill. The pretzel crumb topping on the fish filets were perfect. They stayed in place and weren’t soggy, which was a win-win. The fish itself was flaky and flavorful, but light and exactly what I needed. The pretzel crumb add just the added crunch and contrast to the flaky fish to be perfect. This was exactly what I needed and I was really glad that I ordered this dish. 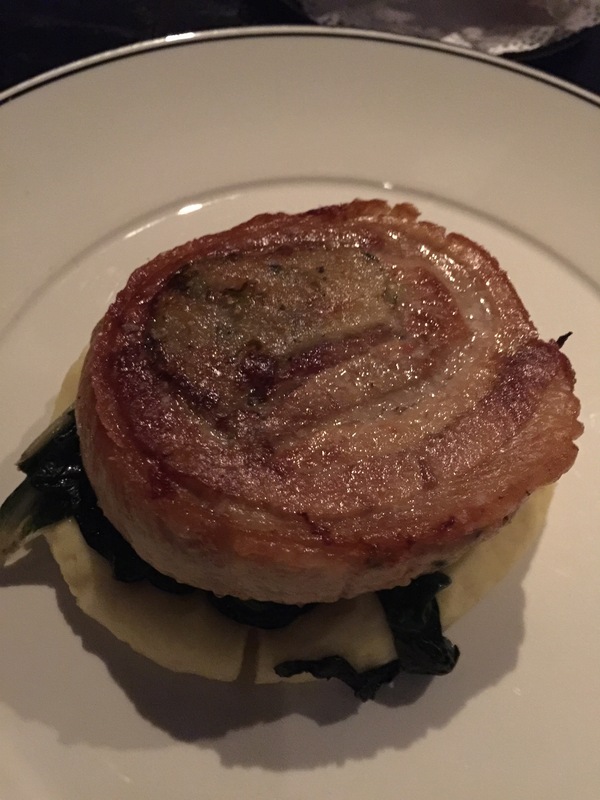 My husband couldn’t resist ordering the wood roasted free range pork belly. It’s pork belly, so you can’t go wrong with it. The menu described it as filled with malt bread stuffing, sage, parmesan on Paris mash potatoes, a bag of crackling, a boat load of black truffle vintage gravy. This dish was impressive. Just seeing the pork belly was amazing, this huge chunk of seared pork belly looked so mouth-wateringly good. It was finished perfectly crisp and crunchy on one side. 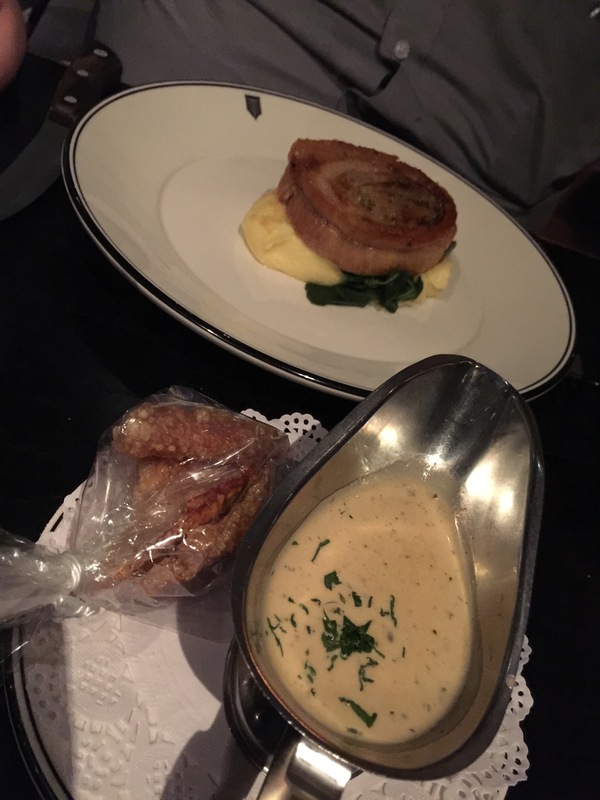 But it was the serving of the black truffle gravy in the accompanying gravy boat along with a bag of crackling that just added the “wow” factor to this dish. My husband immediately poured the black truffle gravy all over his pork belly and he went to town. He absolutely loved the flavor of the black truffle sauce. The mashed potatoes were a terrific pairing to the pork belly as the gravy worked for the potatoes as well. The pork belly was such a star as it was perfectly cooked and tender and chock full of flavor. The entire dish was A+ for my husband. When it came time for dessert both my husband and I were stuffed, but we couldn’t leave without at least sampling some dessert, so we decided we’d split a dessert instead. My Pavola was our choice. 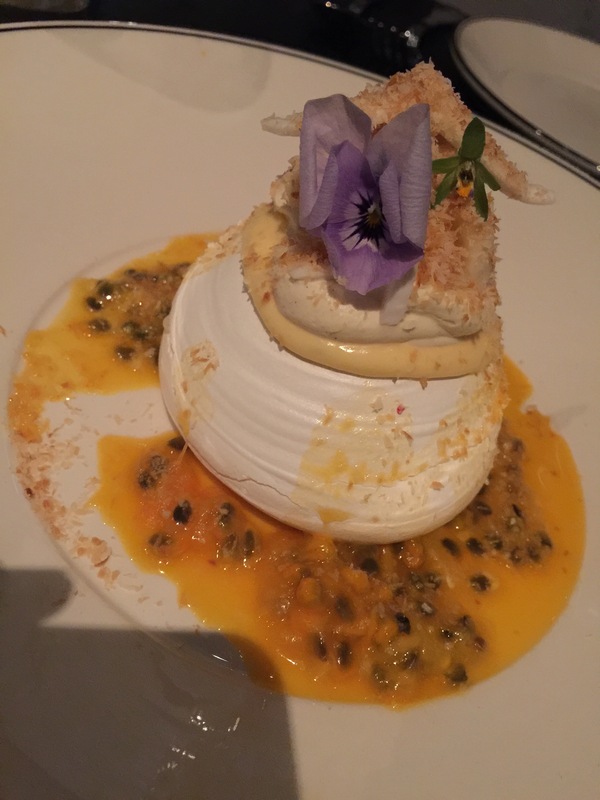 Soft and sticky baked meringue, passion fruit sauce, sugar bananas, green coconut flesh, candied coconut and vanilla chantilly sounded amazing, and when it arrived at the table, it looked even more spectacular. The passion fruit sauce was absolutely mouthwatering in color and amazingly tangy and vibrant in flavor. The baked meringue was perfect with a nice crunchy shell and the vanilla chantilly sauce inside the shell was slightly sweet and created a terrific contrast in textures to the passion fruit sauce and the baked meringue. Atop the cream was the sugar bananas, which I loved, and the green coconut flesh which again provided a flavor contrast and a textural juxtaposition. This was an incredibly creative dessert and though we were full, my husband and I were so glad we decided to split the dessert. It would have been a shame to miss out on the My Pavlova.